A large property that once had a 1920s bungalow and a generous vegetable garden has been replaced by two separate lots – each with a home much larger than the original bungalow – and each with much less garden space. This is not an uncommon occurrence in Portland these days. As our population grows, so too does the number of lots. This division of land is colloquially referred to as ‘lot-splitting.’ So how can a lot be split? There are a few different possibilities that involve very different processes and different opportunities for input from neighbors. Let’s first start with how the Portland zoning code defines a lot: “A lot is a legally defined piece of land other than a tract that is the result of a land division,” in the form of a subdivision or a partition. A partition is when a property is divided into three or fewer parcels. A subdivision is when a property is divided into four or more parcels. In both cases, new lots are being created. Both types of land divisions go through a legislative process called a “land use review”. A property owner submits a preliminary plan application that is reviewed staff at the Bureau of Development Services (BDS). In a partition, this is a Type IX procedure which can only be appealed to the state Land Use Board of Appeals (LUBA). Nearby neighbors and the neighborhood association are notified and given a chance to provide written testimony to BDS, but there is no requirement for the property owner to meet with the neighborhood association. A subdivision is reviewed as a Type IIX procedure which requires the property owner to offer to meet with the neighborhood association and can be appealed to a City of Portland appointed hearings officer. Subdivisions with 11 or more lots are reviewed as a Type III procedure which requires neighborhood association contact and which can be appealed to City Council. In order to be approved, the proposed division must meet certain criteria for lot sizes, minimum and maximum densities, tree preservation, and other criteria spelled out in the zoning code. For example, a 5,000 square foot lot that is zoned R5 (one housing unit per 5,000 square foot) and does not have any underlying lot lines (more about this below), can’t be divided. A 10,000 square foot lot that is zoned R5 could be divided to have two housing units if the two lots meet the requirements for that zone. Once the preliminary plan for a land division is approved by BDS, the property owner must submit a final plat, which is the final surveyed layout of the land division. City staff and the County Surveyor must both approve the final plat before it is recorded with Multnomah County. The final plat can be slightly different from what was submitted in the preliminary plan, but it can’t be radically different. And with that, a new lot(s) is born. For which the deed, or other instrument dividing the land, is recorded with the appropriate county recorder. In practical terms, lots of record are often official lot lines that were created decades (or even a century) ago that exist underneath currently plated plots. How can this be? When many parts of Portland were originally platted around the turn of the 20th Century, lots were sometimes platted with dimensions like 25 x 100 feet. 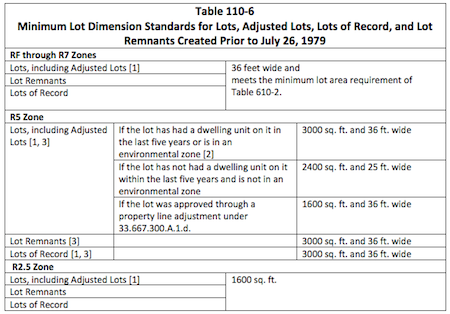 Over time, the lots were packaged together and sold as 50 x 100 foot lots or in other dimensions. While the 50 X 100 foot lots might house the single home that we know today, the underlying 25 X 100 feet lots are still recognized by the city and often can still be developed. As you can see from this map, there are lots of record scattered throughout the city often in concentrated areas like Eastmoreland and St Johns. The process for building on lots of record is not legislative, but administrative. A property owner can submit an application for a lot confirmation. This is reviewed by BDS staff – without public notification or testimony. Lots that are approved for confirmation can then be built upon if they meet the minimum standards in the zoning code. And with that, an old lot(s) is reborn. One additional tool that is sometimes used, especially with lots of record, is a property line adjustment. This is the relocation of a common property line between two adjacent lots or lots of record. This is also an administrative process that does not trigger notification. A property line adjustment does not in itself create a new lot, but it can be used to help shape a lot so that it can meet the minimum requirements necessary for development.